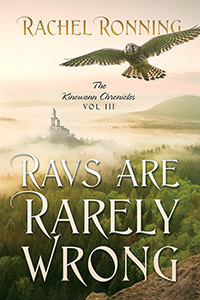 Rachel Ronning’s “Ravs Are Rarely Wrong: The Kinowenn Chronicles Vol III.” Return to the land of Kinowenn in Book 3 of this imaginative series. Join the crew as they travel through the mists, facing damp misery, flesh-eating insects, and nightmare creatures to uncover the source of malice bent on the destruction of the free lands of Kinowenn. The King of Lerramorre struggles with his kingdom reign and Lucy faces difficult decisions as she grows into her magical powers. Can Lucy help her friends unite diverse kingdoms to fight a common foe?